This is a self-portrait of the great but nearly forgotten COSIMO ROSSELLI who, I'm sure, awaits our arrival in Rome. I do believe he is pouring blessings on Arthur's head these days. Among them, a private tour of the Vatican Museums and I'll post about that. If you recall, the Vatican lent Arthur negatives of Sgr. 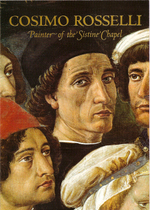 Rosselli's work in the Sistine Chapel for the 2001 show in Florida. If you click on "Vatican Museums" on my sidebar here, you can get a quick, virtual tour of the Chapel. Not great for detail, but you can spot Sgr. Rosselli's contributions and zoom in for Michelangelo's ceiling. I'm writing this at the last second, with our bags piled by the door and forlorn kitties milling about.